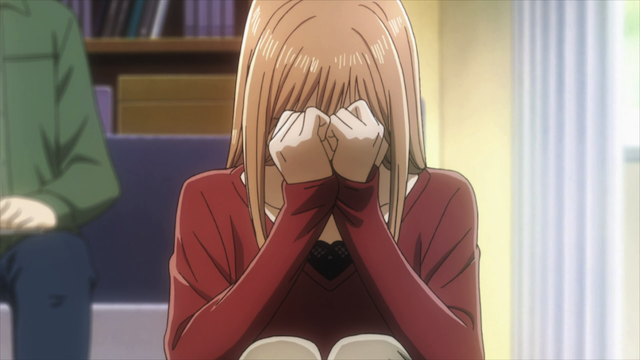 Chihaya Ayase in tears -- hey, it's an emotional show. 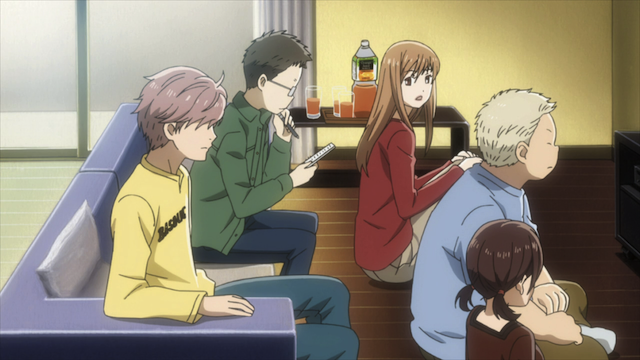 Episode 24 of Chihayafuru does the seemingly impossible: it makes an entire episode about the main characters watching a TV broadcast compelling. We finally get to see the match to decide the new Queen, which delivers quite a surprise. This episode also introduces the Meijin. Let the Karuta begin! 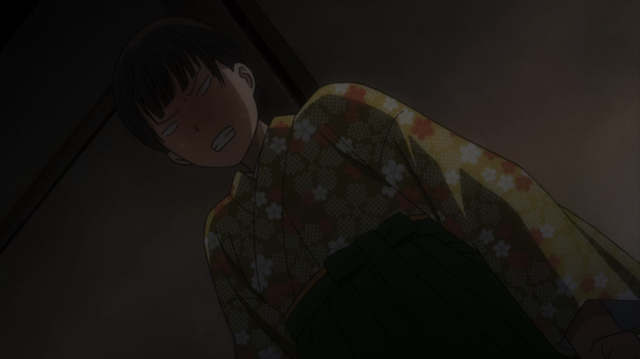 Taichi invites Chihaya up to his room, and Taichi's mother let's Chihaya know exactly how welcome she is in the house. Besides the fact that Taichi’s mother was making the most amazing hissing sound, I just wanted to point out that the Daddy Bear logo also has the depressed shading over its eyes. Clockwise starting at the left: Taichi Mashima, Tsutomu Komano, Chihaya Ayase, Yuusei Nishida, and Kanade Ooe. The Mizusawa Karuta club gather at Taichi’s house to watch the Meijin / Queen matches on Taichi’s big TV. This is the match that we have been cheering Chihaya to get to from the very beginning. This is the match in which Chihaya’s rival Shinobu Wakamiya is defending her title. This is the match in which “the previous Queen” must be put down. Ever since Chihaya lost to “the previous Queen”, I have been looking forward to this match, because I felt the only thing left to me was to see Shinobu punish “the previous Queen” for the way she stole Chihaya’s place in the Western Qualifier. I’ll get my revenge, but there’s no way this could be exciting, right? Curse you Snowmaru! Normally there would be no question of Shinobu delivering a humiliating defeat to her opponent, but she stuffed herself with ice-cream to earn tickets for a rare Snowmaru purse and handkerchief. Now overweight, her game is off. The mentor of the "previous Queen". Worse, the “previous Queen” and her mentor are up to their old tricks again. She has been coached to drag out the match, in hopes of putting Shinobu at a disadvantage. Further, when they started the flashbacks I started to fear that Shinobu had lost her drive, because her grandmother had died and wasn’t pushing her anymore. The battle to become Queen for the next year. Shinobu is on the right. Fortunately Shinobu makes a comeback, and delivers to the “previous Queen” the thrashing that she deserved. The "previous Queen" cries in the dark because she's not good enough. At one point Nishida describes Shinobu’s style as being like Iaido, a martial art that focuses on efficient sword-work, starting and ending in a sheathed state. Chihaya recognizes, however, that Shinobu is connected to the cards, not attacking them. By watching this match she gets a greater understanding of her own deficiency, but as the Meijin match begins, Nishida points out that Chihaya should be studying the current Meijin’s playing style, which, being extraordinarily fast, is more like Chihaya’s own natural style. 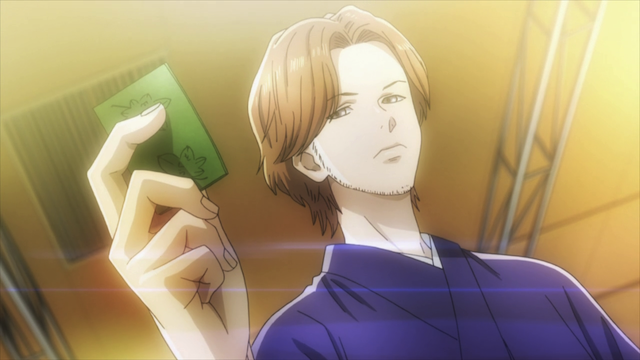 Suo Hisashi Meijin, the greatest Karuta player in the world. 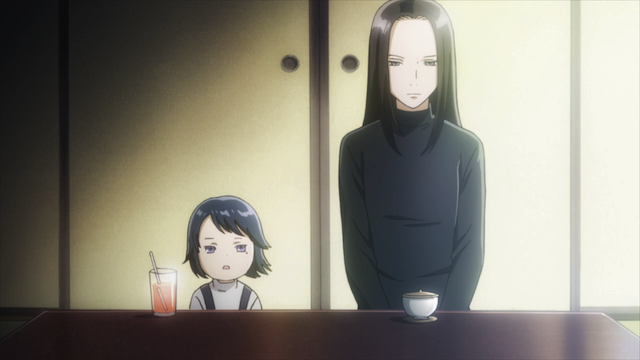 Shinobu Wakamiya (as a child) and her mother. Damn crazy writers! Don’t they know you can’t make an interesting episode about a bunch of people sitting around a TV set? It’s just not natural! I think this show must be the work of…THE DEVIL!!! On a slightly more serious note, I like Taichi’s decision that he can’t “dedicate” himself to Chihaya. That he has to work on his own skills. I think this is actually his best chance to eventually win her. Chihaya couldn’t respect someone who didn’t try their best to become as good as they could be. Not only is that probably true, I tend to think she wouldn’t even notice if he stopped dedicating himself to her. I don’t mean that in a bad way, although I think she is clueless about the situation. I mean, if he said, “no, I have something to do,” I don’t think she would take it personally. She seems the type to let stuff like that roll off quite easily (probably a survival skill from growing up with her sister). I think she’s starting to feel it though, that Taichi’s somewhat treating her a little differently. They’ve been friends for a very long time so she should be able to notice something (I hope). Well she did say it felt odd going to his room. Such an amazing episode. 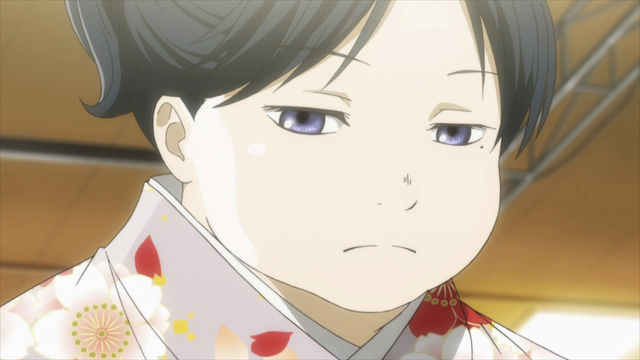 Little Shinobu was just so cute! And I’m very intrigued by the current Meijin. Though his style of playing seems to be similar to that of Chihaya’s, their personalities seem to differ quite a lot. 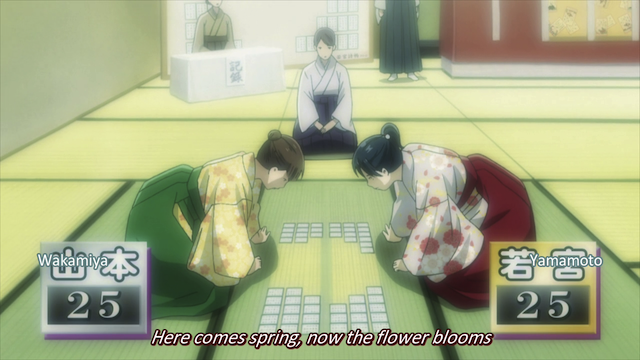 His opponent appears to almost give up on Karuta just because of playing two rounds with him, and Shinobu seems to despise him, even going as far to state that his presence makes her concentration waver. Guess we’ll have to wait till the next episode for more. 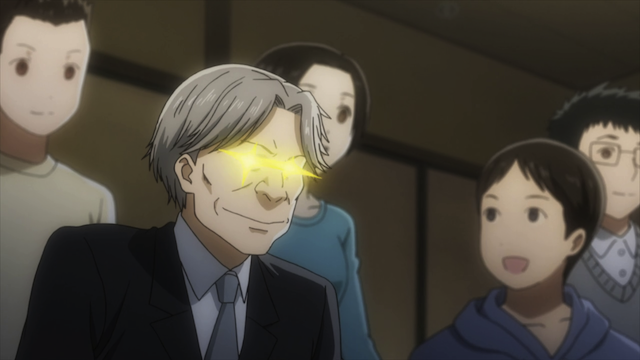 It certainly looks like we’ll get more on the Meijin in the next episode. I almost couldn’t believe what happened to Shinobu either, even after people were posting the page where she showed up like that, but in a way while it leaves Chihaya as the unprecedented most beautiful girl in the show it says a few things about her personality. She tends to get so focussed on her goal, in this case the snowmaru purse, that she loses track of all else. Almost putting that aside it was also great to get an understanding of her character and learn her what drives her to play Karuta through her backstory, and that she wasn’t just gifted either. Her skill came at a cost. But anyway she should be back to normal when Chihaya catches up to her, and I’m interested to see what Suo’s playstyle is like. Shinobu appeared to regard him as an abomination. 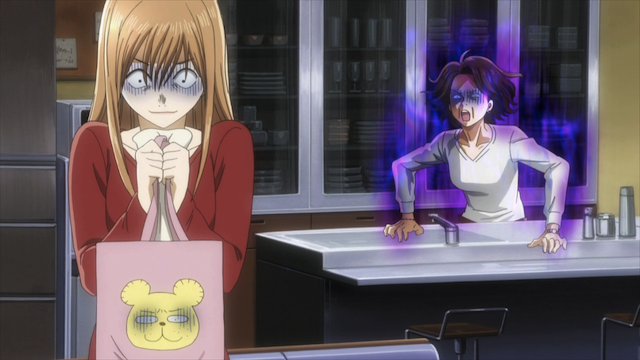 Other than that it was fun to see Taichi’s mother overreact around Chihaya. Yes, I really liked learning more about Shinobu’s backstory. I hope we get a second season. There are all of these great characters that have so much living to do!